This hallway cabinet is perfectly a classic addition to turn living room interior into a contemporary art gallery. Made up acrylic and glass, lustrous silver finish glass makes a dazzling showcase and shimmer accent on door front under X crossed glass panel giving it a beautiful appeal. 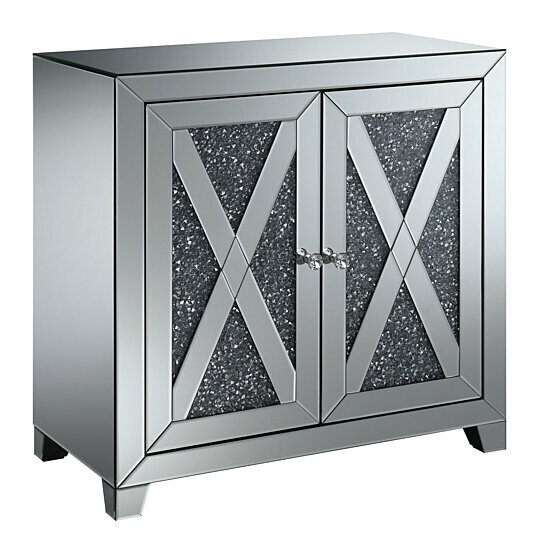 This cabinet consists two doors with attached diamond pull-out knobs for easy access to store media components or other accessories. Featuring innovative design, this will turn up the look of your living space to the next level with serving its purpose to the most.